Laura Branigan makes the short list of great ’80s pop divas. She hit the scene with 1982’s Branigan and gained further momentum with follow-up albums Branigan 2 and Self Control over the next two years. Unfortunately, Branigan’s trajectory changed with her fourth album, 1985’s Hold Me. The album has its moments with the title track and “Spanish Eddie”, a remake of sorts of her earlier smash “Gloria”. Overall, though, Hold Me failed to achieve the chart success of Branigan’s first three albums. That would explain why Hold Me is obscure on CD compared to the earlier albums. Hold Me saw two CD releases in the mid-’80s, one in Japan and one for the U.S. market. In the U.S., Hold Me was released on the Atlantic label under catalog number 7 81265-2. The album appeared in the States as West German PolyGram, Japanese JVC, and U.S. Non-Target pressings. Despite these three pressings, Hold Me quickly went out of print making these discs very popular with collectors. Here we focus on the West German pressing. As a PolyGram pressing, there is no clear plastic ring at the center of the Hold Me CD. The disc bears the typical Atlantic Non-Target label design of the period — red and black rings around the perimeter, a red Atlantic logo at 9 o’clock, black text, and no paint coating. The text “MADE IN WEST GERMANY BY POLYGRAM” is printed along the perimeter. The matrix code around the aluminum hub is “7567 81265-2 2895 679 01 #”. The accompanying inserts were printed in West Germany. Over the years, some obscure ’80s albums have been reissued on CD to the delight of fans and collectors alike. In some cases, this has caused the value of the rare original CD to drop sharply. Given the state of the physical media today, this seems unlikely for Hold Me. Thus, expect Hold Me to remain a rare find on CD and for the West German pressing to command a premium. Shown below is the cover and back insert for the U.S. issue of Hold Me, along with the West German pressing. The cover for the West German pressing of Laura Branigan Hold Me (Atlantic, catalog number 7 81265-2). This is the standard cover artwork for this album. 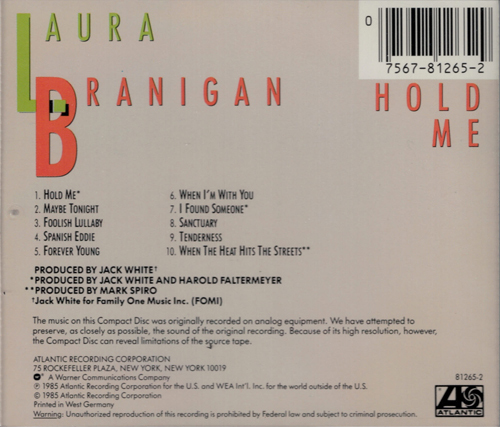 The back insert for the West German pressing of Laura Branigan Hold Me (Atlantic, catalog number 7 81265-2). As noted in the bottom left corner, this insert was printed in West Germany. The West German Non-Target pressing of Laura Branigan Hold Me (Atlantic, catalog number 7 81265-2). The disc has “MADE IN WEST GERMANY BY POLYGRAM” printed along the perimeter, and the matrix code is “7567 81265-2 2895 679 01 #”.